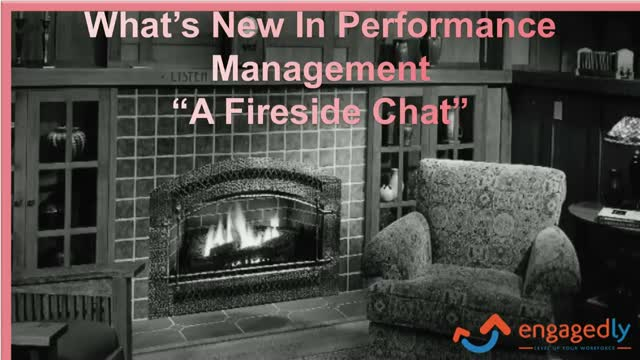 Engagedly's annual Fireside Chat where we talk about the changes in the Talent Management field in the area of Performance Management. What some of the trends we have been seeing and how HR and Organizational Leaders are addressing Performance Management and Employee Engagement. A key issue for businesses, in every industry, is that employees forget 65% of the material covered, and after six months, that number jumps to 90%. remember concepts and details and will increase over time engaging employees in a way that lectures, documents and even PowerPoint rarely do. There has been a lot of talk about killing the annual review. Should you really do away with the annual review or should you change it? What are some of the pros and cons of the annual review? Join us to learn about when it makes sense to do or not do an annual review. When we profess performance matters, are we communicating that every step of the way starting with step 1-Onboarding? Organizations tend to focus on Performance Management for employees once the employee is onboarded and warmed up to the workplace. However, performance management starts on day 1. During the onboarding process not only an employee is introduced to the people and processes, they are really introduced to the performance culture you have. An effective onboarding process will provide a conduit to set the right expectation, orientation and tools to start the relationship on the right foot. In this webinar we will discuss how tools like HRCloud and Engagedly can work seamlessly to provide a delightful and effective onboarding experience and actively engage the employee on day 1. We will learn some best practices on driving the culture of performance driven in every step, from being a new hire to an employee. Workplace culture expert and enthusiast, Charlie Judy, creator of Workplace Genome, will give us some insights on how to envelop our performance management tools with a culture that drives real, tangible, and meaningful results. Performance management tools and technologies are important. They heighten visibility to the value of providing regular and meaningful feedback, they instill accountability, and they keep us on track. And, most importantly, they demonstrate our commitment to developing our people. But if our culture - the words, actions, and behaviors our employees experiences every day - doesn't reinforce and clarify that commitment, then all bets are off. We cannot and will not get the most of these tools and technologies unless everything about our culture sings "performance management." Charlie Judy built a successful career as an HR executive over 25 years with some of the world’s most prominent professional services firms like Deloitte, Navigant, and Baker Tilly. He has traversed the global economy while working and living in New Orleans, St. Louis, New York, Brussels, Belgium, Hyderabad, India, and Chicago. He’s a regular speaker, prolific writer, and well known future-of-work pundit who has resolved to re-humanize the workplace while disrupting the traditional paradigms of management to which we’ve fallen prey. Charlie is the Founder and CEO of WorkXO. Forward thinking leaders in growth-oriented organizations use the Workplace Genome®, their cloud-based culture management platform, to measure and analyze their organization's culture, to uncover the distinct priorities for heightening their success, and to guide their teams to meaningful action on them. Charlie is a graduate of Tulane University, a CPA, an SPHR, and a SHRM-SCP. Few areas of HR have seen the rapid change in approach and innovation like the Talent Management has see in the last couple of years. Organizations like Microsoft and GE that prided on stack ranking are doing away ratings and traditional reviews. Many organizations have decoupled performance reviews from compensation. So where is this leading to and what is working? Join our Engagedly team to discuss what we are seeing based on hundreds of discussions with leading HR practitioner. Managers and employees agree that most performance management processes have become check-the-box exercises. Although both groups typically understand the value in having performance discussions on a regular basis, many people perceive the actual process to be ineffective. As a result, organizations are seeking innovative ways to improve performance management. Motivating employees is an art and a science. Is it the Extrinsic motivators or is it Intrinsic or is a combination of both? Aaron Adams, Head of HR Strategy & Alignment discusses what the research shows on what motivates employees to inspire them to realize their full potential. 360 Reviews/feedback can be an effective employee development and review tool. However too many organizations use it without defining the true purpose and the outcomes they want. Aaron Adams, Head of HR Strategy & Alignment discusses how there are different approaches to 360 . Depending on the what the organization’s goals are, one needs to carefully craft the approach. Organizations perform best when the employees are aligned with the organizational objectives. Effective alignment helps employees engage and create focus, giving them a clear view into how their personal contributions and successes help realize organizational objectives. Organizations mistake their annual performance appraisal as performance management. Focus needs to be on Managing and Improving performance not just evaluations. As organizations are actively looking for ways to redefine their performance management process it’s important to start with a simple question…what is performance management? This may sound like a very simple question, but people consistently confuse performance management with performance appraisal. In this webinar we’ll take about the difference between performance management and performance appraisal. Additionally, we’ll talk about key things to consider when developing a meaningful performance management process for your organization. Healthcare workers in assisted living facilities and nursing homes are a valuable asset. With a growing aging population, it is more important than ever to actively engage and develop high performing healthcare workers and caregivers. Malou Van Eijk with Applewood Our House will talk about some of the innovative approaches she has taken to accomplish just that. What it really means to be a strategic HR leader. This relaxed chat addresses how HR leaders can earn that seat at the table by focusing on profitability, innovation, and the growth of the company. Banking and Student loan servicing industry is a highly regulated industry with several compliance requirements. Developing an engaged culture yet being compliant can be a tricky line to walk. Garrett Wilson, Director of Talent and Culture at ReliaMax discusses how they went about building a engaged culture of high accountability and independence; And developing HR policies for empowering employees while being compliant with regulatory requirements and how Engagedly platform has helped them along the journey. Do you think employee feedback is valuable? Would your organization benefit from people sharing more feedback? If you answered “yes” to both of these questions then we invite you to attend our webinar on How to Build and Sustain a Feedback-driven Culture. Pulling from the large body of research on feedback, Aaron Adams, Partner of HR Strategy & Alignment for Engagedly. will be sharing a 7-step process that any organization can use to embed feedback into their culture. In this 30 minute webinar Aaron will provide you with some tools that you can use to build and sustain a culture of feedback.